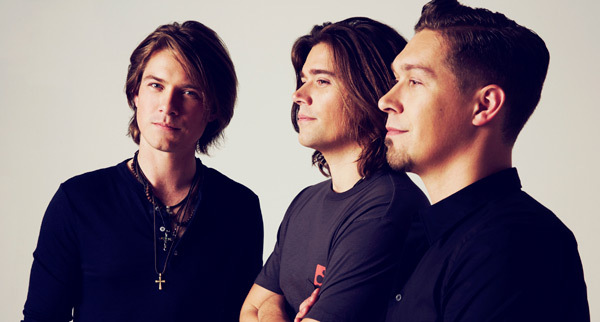 In celebration of the band’s 25th Anniversary, multi-Grammy nominated pop-rock trio HANSON today announce the Australian leg of their Middle Of Everywhere World Tour which includes Sydney, Melbourne, Brisbane, Adelaide and more this June. The world tour also includes concerts in Europe and North America, with a South American leg still to be announced. The band will kick off the extensive world tour on May 21st in Tulsa, Oklahoma with a headlining set at their own rapidly growing The Hop Jam Beer and Music Festival. “Making music together for 25 years is a milestone that we had to acknowledge, and what better way to do it than an anniversary tour,” said keyboardist Taylor Hanson. Added guitarist Isaac Hanson, “This year is not only about the two decades of music, it’s about celebrating the incredible community of fans who have been with us, singing along year after year”. In addition to HANSON’s 25th Anniversary, 2017 is the 20th Anniversary of the band’s debut release Middle Of Nowhere, led by the iconic global smash hit ‘Mmmbop’. This June, Australian music lovers will be treated to feature performances of the group’s best-known material alongside fan favourites spanning their extensive catalogue. Coinciding with their benchmark 25th year together, over which the group has released six studio albums and sold over 16 million albums, later this year, the band has confirmed they will release Middle Of Everywhere – The Greatest Hits, a comprehensive collection which includes hit singles “Mmmbop”, “Where’s The Love”, “Weird ”, “This Time Around”, “If Only”, “Penny And Me”, “Thinking ‘Bout Somethin’”, “Get The Girl Back”, plus their brand new single “I Was Born”. Founded in 1992, the trio of brothers began performing classic rock ‘n roll and soul music, and writing original material, crafting a unique blend of harmonies and organic soulful pop-rock. The group took the world by storm with their debut major release in 1997, ushering in a string of US top 40 singles and establishing them as one of the world’s leading music artists. In 2003, the group founded their own independent 3CG Records, starting a new era for the band with their #1 independent album Underneath, featuring hit single “Penny And Me”, positioning them among the most successful independent bands to date. Since then, HANSON has released three studio albums under their label, toured the world cultivating a vibrant global fan base engaged by their dynamic live performances, and released an ongoing stream of special products direct to their devout fan community. In 2013, the group diversified its brand with the founding of their Hanson Brothers Beer Company, and in 2014 added The Hop Jam Beer and Music Festival based in their hometown of Tulsa, Oklahoma. The festival brings together artists and brewers from all over the world, culminating in one of the leading Craft Beer and Music Festivals in the US, with over 40,000 attendees, occurring this year on May 21st in Tulsa. The Middle Of Everywhere Tour showcases more than two decades of music in a celebratory world tour, alongside new music that will be followed by a further release in 2018. HANSON will land on Australian shores straight off the back of UK and European dates, for what will be some of the biggest and best 25th Anniversary celebratory shows ever!